It seems like Rhode Island is finally catching up to the doughnut craze that hit New York about 8 years before. It may have taken a while, but the doughnut renaissance of Rhode Island is finally here with the opening of a handful of gourmet doughnut shops in and around Providence. 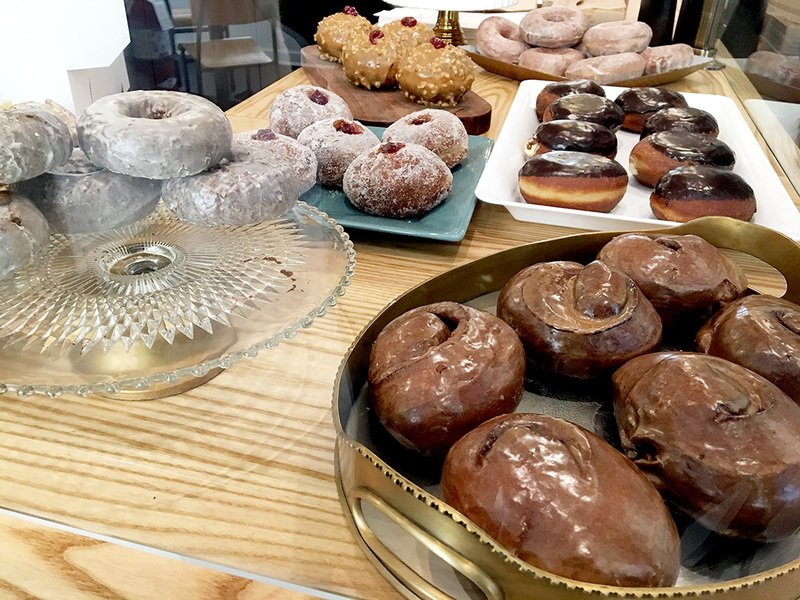 One of those bakeries is KNEAD Doughnuts that not only opened up in downtown Providence (i.e. DownCity), but also provides delivery services to downtown businesses. That’s right – doughnut delivery services! After getting a strong recommendation to try out these doughnuts, I made sure to make my way into the city one morning before they sold out. Drivers beware because KNEAD Doughnuts is located downtown in Providence where the parking is slim to none. If you’re creative or willing to break a few traffic laws (not recommended obviously! ), you’ll manage, but be prepared to circle the block a few times to find a spot. Otherwise, it’s best to go on foot if you work nearby or happen to be in the area. 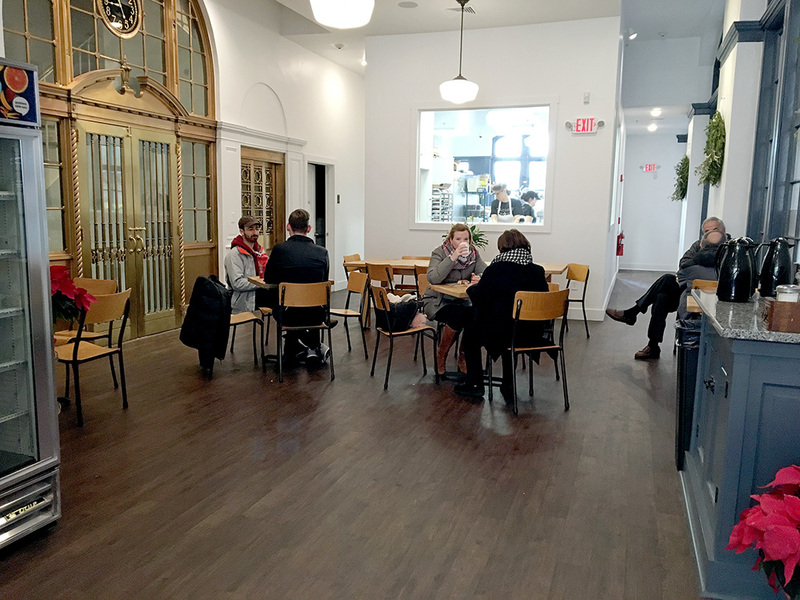 The interior decor of KNEAD is simple and looks more like a cafe in the lobby of a hotel than a separate shop all its own. The simplicity is nice though because it keeps the focus on natural architecture of the building and the food. Through a window in the back, patrons can see the kitchen staff making doughnuts. The staff are friendly, helpful, and willing to answer questions as well as offer suggestions. Sometimes, the presentation of food is enough to make you love it. Walking into KNEAD Doughnuts was kind of like that with all of the doughnuts beautifully displayed at the order counter. Not only were they presented well, the doughnuts themselves looked like each one was made artfully with care. 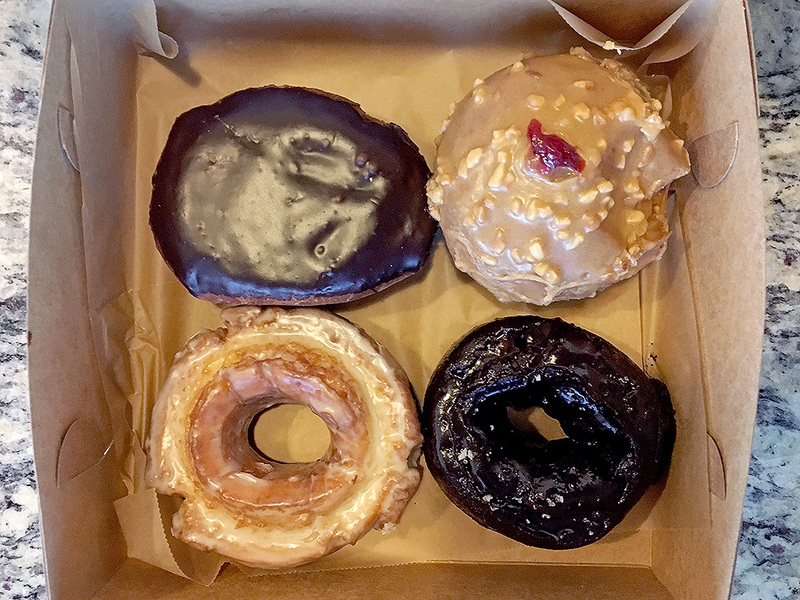 I went to KNEAD after looking at their menu online thinking I knew what I wanted to try, but as soon as I saw the other doughnuts, I changed my order in my mind about three times before finally settling on the four doughnuts I tried. Vanilla Glazed (Old Fashioned Style) – No matter where I try new doughnuts, I always have to try a plain or vanilla glazed doughnut. If a bakery can’t make one of these properly, then it’s really not worth trying anything else. In this case, the name doesn’t inspire because “Vanilla” and “Old Fashioned” often mean “boring,” but that wasn’t true here. I don’t particularly enjoy old fashioned style doughnuts because they tend to be dense and sometimes dry. Nonetheless, the old fashioned doughnuts at KNEAD are more like cake style doughnuts and the cake style doughnuts taste like actual cake! The glaze is heavy and creates a kind of candy shell around the doughnut that keeps it from drying out. I thought the sugar might be a little much due to that outer shell, but the whole thing just worked. The Vanilla Glazed Old Fashioned turned out to be my favorite of the KNEAD doughnuts I tried due to it’s simplicity and well-made quality. This is a great flagship doughnut! Boston Cream (Brioche Style) – The Boston Cream doughnut is one of my favorite styles of doughnut. Traditionally, it is a yeast leavened pastry dough or brioche doughnut injected with a rich custard (or pastry cream in rare cases) and topped with a chocolate frosting. KNEAD makes theirs with a brioche dough that is filled with what seemed like heavy whipped cream. 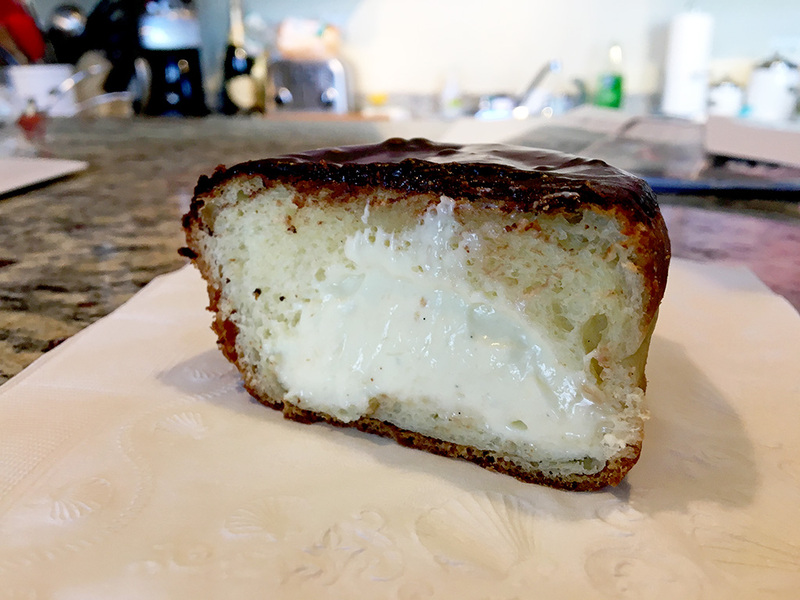 Personally, while I found that the technique was spot on and the filling generous, I thought this fell a little short of being an honest to goodness Boston Cream doughnut. My wife, on the other hand, enjoyed the lighter whipped pastry cream, so this one probably just comes to the individual. Boston Cream purists may balk, but those willing to try a different take on a classic may enjoy it. 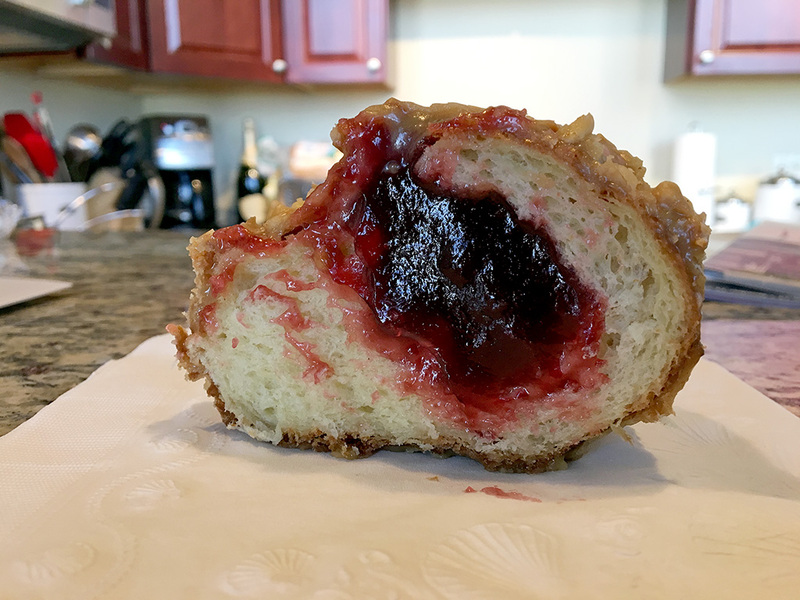 Peanut Butter and Jelly (Brioche Style) – Not only was this peanut butter and jelly doughnut just stunning to look at, the technique for making it boggles the mind. This is another doughnut that may not be for everyone, but it’s a must try for sure just to get a sense of what KNEAD can do. Biting into this doughnut reminded me exactly of eating an overloaded peanut butter and jelly sandwich as a kid. The other thing to point out is that unlike most doughnut shops, KNEAD doesn’t seem to ever skimp on the filling. Chocolate and Sea Salt (Cake Style) – I got this Chocolate cake style doughnut topped with chocolate frosting and sea salt fresh from the kitchen. It was still hot when they put it in the box. This is the first cake style doughnut I’ve ever tried that actually tastes like cake. Usually cake style doughnuts are dense, firm, and can border on dry. KNEAD cake style doughnuts taste like eating a piece of actual cake, which I found not only interesting, but delicious as well. KNEAD Doughnuts makes artfully crafted gourmet doughnuts that are beautiful as well as delicious. 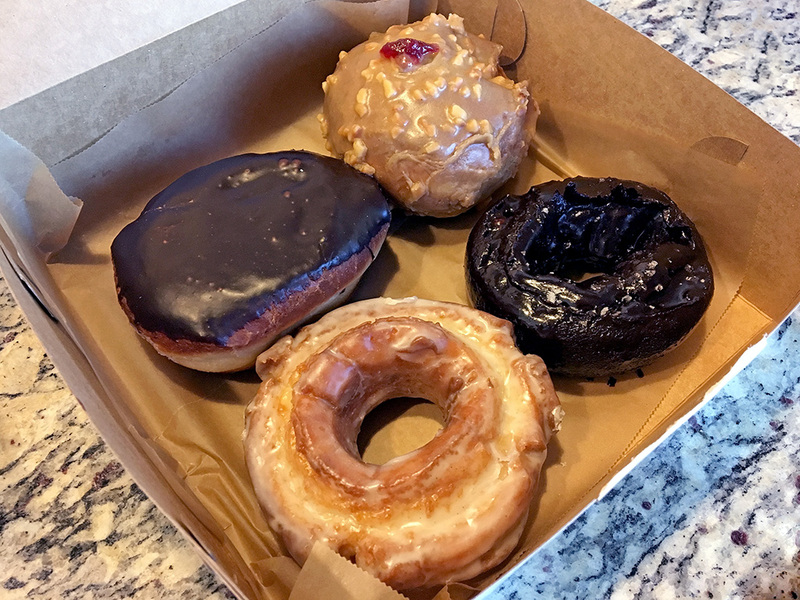 In general, the donuts deliver big on flavor and some of the more intricate flavor combinations border on the overwhelming in some cases, but for those with less of a sweet tooth like me, that’s what the simpler flavors are for. 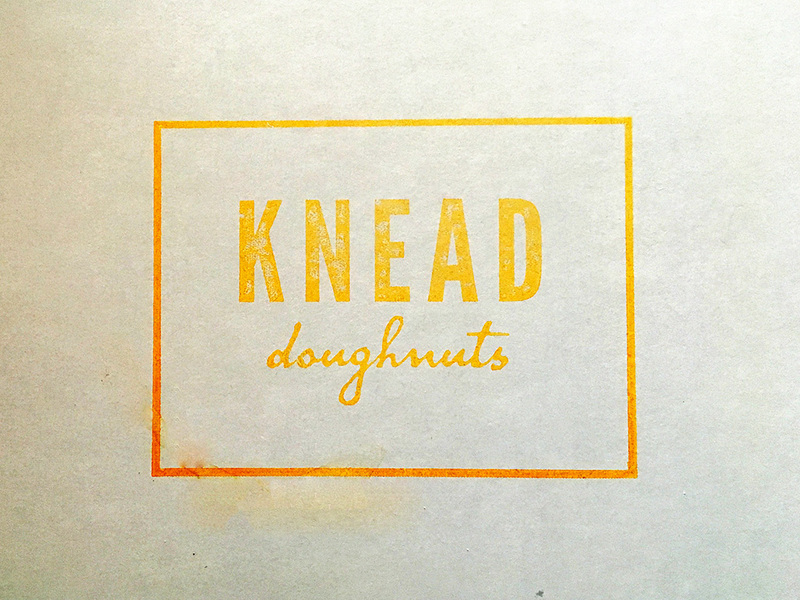 KNEAD makes fresh doughnuts daily and any doughnut connoisseur should definitely give them a try. Yes!!! I absolutely love this place. They’ll definitely give PVDonuts a run for their money. I agree. They each do something better than the other, so it’s great to have both places depending on what you want that day!